Galen Central’s new weekly series will preview the basketball team of USC’s football opponent. With the USC football squad hosting Utah on Saturday, here is a preview of the Utes’ basketball team, with the help of former Utah guard Drew Hansen. Hansen started in the backcourt for Utah in the 1998 NCAA championship game alongside Andre Miller. Hansen is currently a Senior Attorney at Theodora Oringher PC, and he was honored as a 2013 Southern California Rising Star. Read earlier previews of Washington State, Boston College, Utah State, Arizona State and Arizona. CLICK HERE for tickets below face value to USC football games from our friends at ScoreBig. As Drake would say, Utah “started from the bottom now we here.” It is not immediately known where “here” is, but Utah certainly started from the bottom. Two years ago, when the Utes joined the Pac-12, they only won six games. In fact, Drew Hansen’s Utes won more games in the 1998 NCAA Tournament (five) than Utah did in conference (three) during the 2011-2012 season. Last season, the Utes only won five games in conference, but got hot at the right time and won two games in the Pac-12 Tournament, including a victory over USC. This year, coach Larry Krystkowiak enters his pivitol third season in Salt Lake City. Krystkowiak has much more talent than he inherited in 2011. The Utes are led by sophomore forward Jordan Loveridge, who averaged 12.1 points and 7.0 rebounds last year. Brandon Taylor (no, not USC’s Brendyn Taylor) started at guard last season as a freshman. 7-foot center Dallin Bachynski is the younger brother of Jordan on ASU. JC trasfer Delon Wright, the younger brother of Portland Trail Blazers forward Dorell Wright, is one of the squad’s seven newcomers. 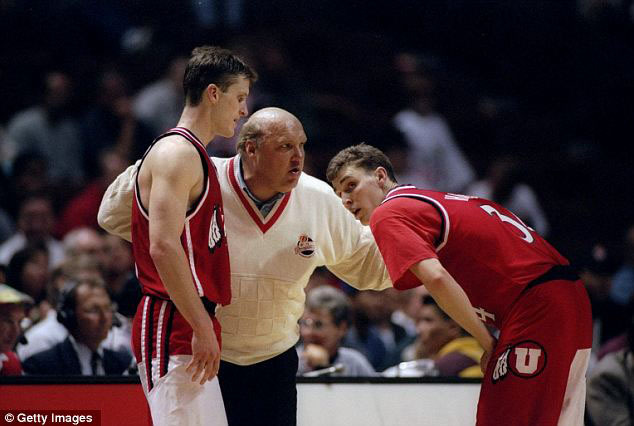 The most famous figure in Utah’s basketball history is Rick Majerus, who coached the team from 1989-2004, including the squad with Hansen that played in the Final Four in 1998. Majerus, of course, was hired to coach USC in 2004. Despite telling reporters it was his “dream job,” he resigned after only five days. Hansen plans on going to the Galen Center when USC hosts Utah on February 13. He has fond memories of playing against the Trojans. On December 23, 1995, Utah slaughtered USC, 84-49. “It was a very nice victory for us against a Pac-10 school,” Hansen said. A blow-out like that ensured the Utes made “no new friends,” as Drake would say, with USC fans.